I have been ALL OVER the cupcake in a jar trend that is popping up all over Pinterest. With the recent acquistion of a large number of mason jars, thanks to GB's sister KC, I decided to give it a whirl. I prepared the amazing cake batter that I showed you in the I Give Myself an A+ post. I divided the batter in 4 bowls for the different colors. Using gel food color, I added 4 drops to each bowl. According to the box of food color, "Use a a little for vibrant color." This is not my idea of vibrant. I decided to add 4 more drops. This is a little bit better. If I had more time I would have continued to add color until the batter was almost neon. However, I was running late for a party, like always, so I thought this would have to do. I read somewhere that this technique is best done when the batter is put into a gallon sized plastic bag followed by a snip of a corner and squeezed into the jar. As you can see above, just plopping the batter in the bag was very messy. I found the technique below much easier. Next, I snipped the corner off the bag. I started getting really nervous. There was a lot of cake batter in the kitchen. With a clumsy girl like me, I certainly did not want batter leaking everywhere. Slowly, very slowly, I added the batter into the jars. I only filled the jar halfway to allow for room for the fully baked cake. As you can see, I wasn't perfectly neat in filling each jar. Somehow I managed to get cake batter all over my hands. Surprised? I wasn't. I popped these little guys into the oven at 325° for 45 minutes. They managed to cook beautifully and perfectly. Not one cake spilled over the top. Now these bad boys needed frosting. 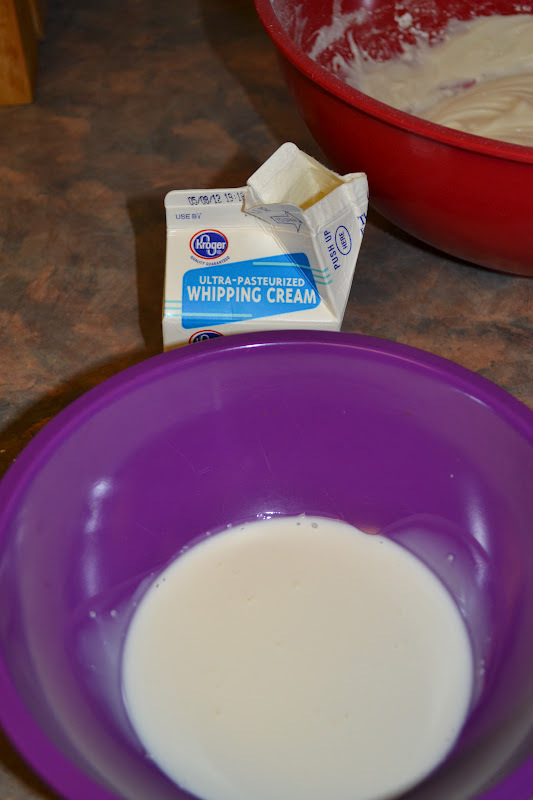 I found a great cream cheese frosting recipe at Not So Humble Pie. Ok, I know cream cheese frosting doesn't really fit white cake, but I really wanted to try this recipe. All I needed was cream cheese, powdered sugar, heavy cream and vanilla. Next, I was supposed to whip the cream until "soft peaks form." Not knowing what this meant, I googled it. I may not have done this right. This didn't seem like a soft peak to me, so I kept on whipping. Is this a soft peak? I wasn't sure, but I assumed it was. I continued on as if I had executed this step accurately. Turns out this is one of the best tasting frostings I have ever made. It definitely belongs on cinnamon rolls, as suggest by the blogger, but GB and I still enjoyed it immensely! What do you think? Obviously I need more practice, but I'm kind of proud of myself!